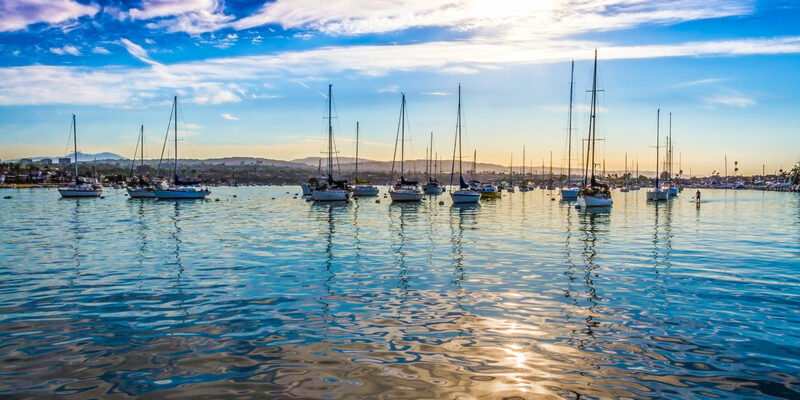 Pretend you’re one of California’s elite as you cruise through Newport Beach’s luxurious harbor — perhaps not on a million-dollar yacht, but on a charming electric boat complete with wine, cheese and a stunning sunset. 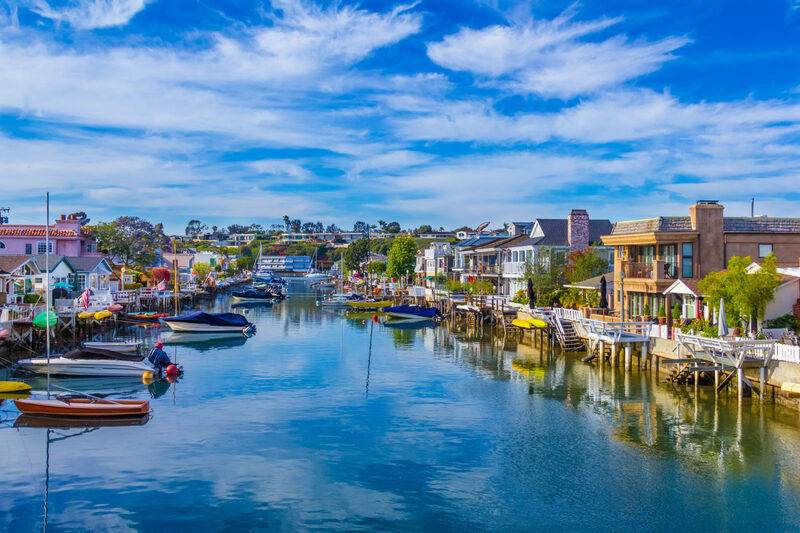 Located in California’s Orange County, aka the “OC,” Newport Beach is known for its affluence, elegance, glamour — and scenery. To better enjoy the area’s stunning oceanfront, my husband and I boarded a boat in Newport Harbor. 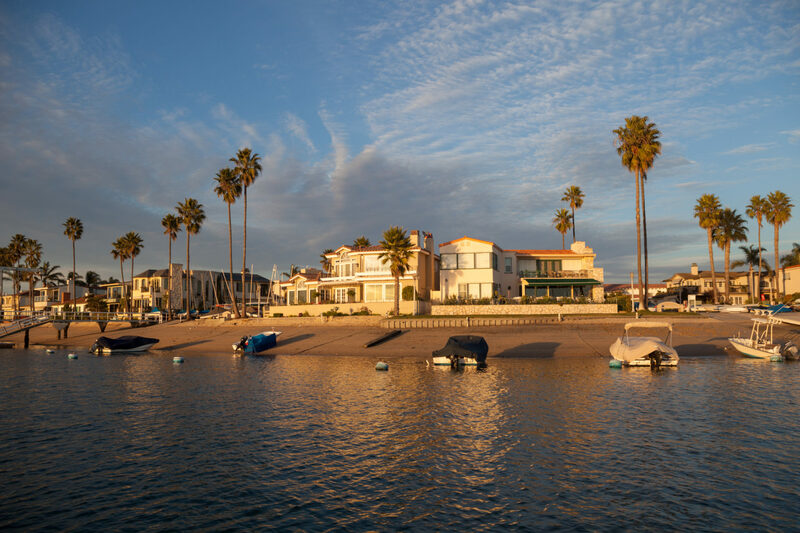 As the largest recreational harbor on the West Coast, it’s the perfect launching point for exploring the palm trees, blue waters and California sunshine. We chose one of the most popular methods of transport: Duffy boat. These cute little electric boats, described as “golf carts on water,” come with surrey tops and go only five miles per hour, which is the maximum speed in the harbor. It’s just the right pace for enjoying the deluxe views. Each boat holds just 10 people; because the boats are electric, they leave no harmful gas or oil behind in the lovely waters. Most boats come with window enclosures for cooler days or evenings once the sun sets, as well as CD players and MP3 player connections so you can listen to your favorite tunes as you cruise the harbor. You can rent Duffy boats by the hour or day, and anyone with a valid driver’s license who’s at least 18 can drive them. However, we chose to use a local guide who gave us fantastic insight about the area, so all we had to worry about was enjoying the ride. While you can make day-of reservations for Duffy boats, it’s better to book in advance; this activity is popular with both locals and tourists, especially during busier seasons. If you simply enjoy gazing at the multi-million dollar homes and mega-yachts around Newport Harbor, you could be entertained for hours. But there’s plenty more to see! 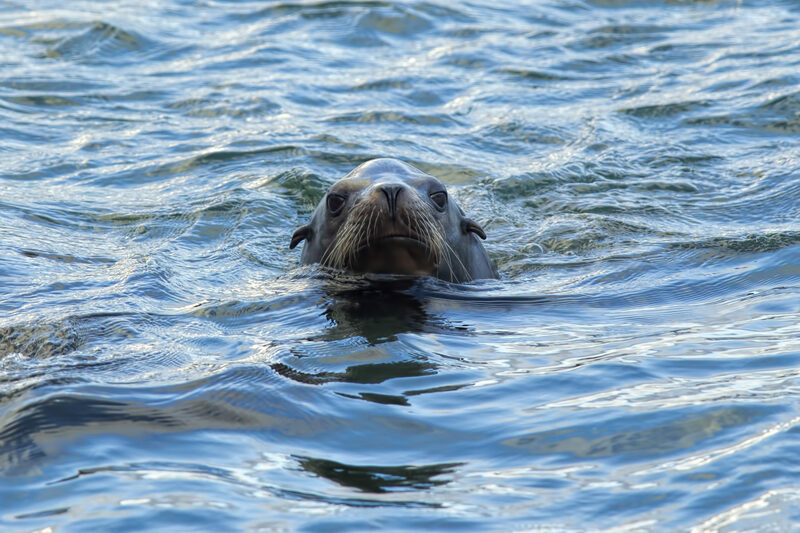 We got a kick out of the wildlife in the harbor — playful seagulls caught a ride on our boat, while sea lions swam alongside us and sunned on buoys, boats and piers. One of many impressive yachts that line the harbor is the “Wild Goose,” formerly owned by actor John Wayne. Hornblower Cruises now owns and hosts special events on the 136-foot-long vessel. Built in 1942, the yacht features three decks and gorgeous paintings. It also once served as a World War II minesweeper prior to Wayne’s purchase. Our guide explained how this area was once the playground for much of Old Hollywood, looking for a vacation from their busy movie-making schedules. We cruised by the historic Balboa Pavilion, built in 1905 to host waterfront dinners and dances for these elite visitors. As we passed, we imagined the likes of Greta Garbo and Clark Gable standing inside. It is one of the state’s last remaining waterfront pavilions and icons of this Golden Age. Perhaps our favorite site was the Balboa Fun Zone. Located on Balboa Island, the quintessential California boardwalk amusement park features a fortune teller, Ferris wheel and carnival games. You can park your boat at the dock to enjoy a nostalgic stroll through time, and even continue walking a few blocks along the island to reach the beach and pier for a sunset stroll. If you follow the shoreline around the harbor, it’s about a 14.5-mile journey that will take you approximately three hours to complete (without any stops). If you get hungry on your cruise, many of Newport Harbor’s restaurants — like Sol Cocina, The Cannery and Back Bay Bistro — let you pull up your Duffy boat to the dock and hop out to enjoy a gourmet meal harborside. You can also call ahead to restaurants like Pizzeria Mozza or A Market; they’ll bring your meal to your boat so you can dine while you continue cruising. We chose to snack on crackers, wine and cheese, saving our heartier meal for dinner afterward on nearby Little Balboa Island. Once the sun set, we stepped back to reality. 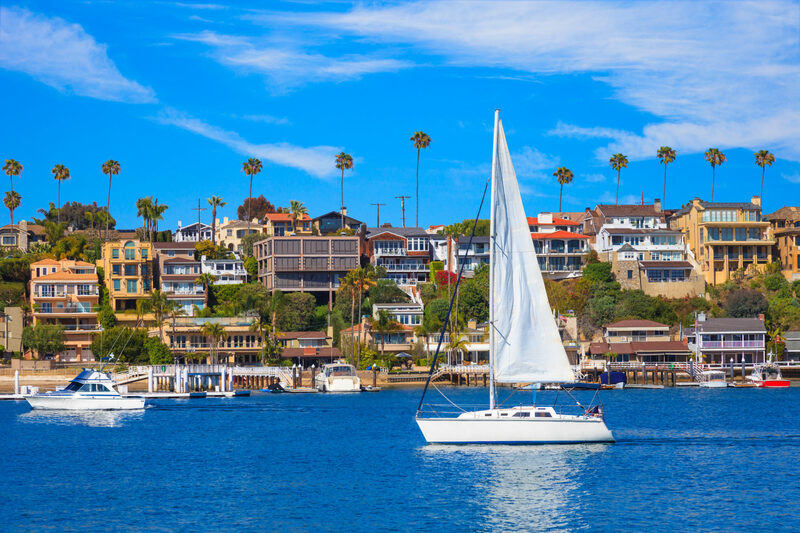 But our charming cruise through Newport Harbor let us enjoy the most alluring aspects of Southern California life — if only for a moment.